Duncanville is a mid-sized city located in the state of Texas. The city has a population of 39,599 residents. In Duncanville, there are 3,534 people per square mile, which is well above the national population density average. Individuals of White (58%) and Black or African American (34%) backgrounds make up a significant portion of the population of the city. Additionally, more than a quarter of the population of Duncanville are of Hispanic or Latino origin, and 30% of the population also speak Spanish. If you’re considering moving to any new city, it could be a very intimidating task. However, it could also be a great experience if you are willing to get to know the city before actually living in Duncanville, Texas. The best areas in Duncanville and in surrounding cities are easier to find when you are able to make informed decisions. Using data from crime, weather, employment, housing, you will see a detailed breakdown of the most important information as well as comparisons to the Texas and national averages. With a livability score of 80/100, Duncanville is ranked #1,651 in the United States and #367 in Texas. Pack your bags! 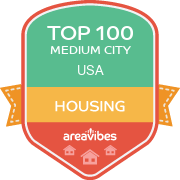 This is a very high score in comparison to other US cities. Living in Duncanville could be a great choice! Duncanville also ranks in the top 10 percent of all cities, which is no small feat! There are seven total categories that form the livability score. Duncanville scores well for amenities (A+), cost of living (B-), weather (B), education (B) and housing (A). Duncanville does not rank well for the following: crime (F) and employment (D). It might be a good idea to take a closer look at each category to find out why. Location, location, location - possibly the three most important words in your search for a new place to live. Fortunately, in Duncanville, there is no shortage of amazing local amenities and interesting things to do. Based on multiple factors including: median home and rental prices, appreciation rates and home affordability, Duncanville has received high marks in the housing category. Based on these calculations, the apartment rental and real estate market appears to be very healthy. There are many factors that go into deciding if an area is the right fit for your lifestyle. Certain “must haves” like low crime, great schools and nearby amenities are all at the top of most people's lists. But before even considering if those options are available, most people will need to know if the real estate in Duncanville is actually affordable. The median home price for Duncanville homes is $118,000, which is 17.3% lower than the Texas average. If we take a closer look at the affordability of homes in Duncanville, we’ll see that the home price to income ratio is 2.3, which is 11.5% lower than the Texas average. For most people, purchasing a new home is the biggest investment they will make in their lifetime. Taking a look at overall real estate appreciation rates in Duncanville will offer some insight into determining if your home purchase will be a solid investment for years to come. In Duncanville, the year-over-year appreciation rates were 13.8%, and the 5 year appreciation rates came in at 12.7%. How Do You Rate The Livability In Duncanville? Duncanville is a small city with a big feel. The best thing I like about Duncanville, Texas is the diversity. Duncanville is a suburb of Dallas and is about 15 miles away, but there is no need to travel to Dallas. Duncanville offers a lot for families including Joe Lake Pool where you can enjoy fishing or sightseeing. Duncanville has a lot of restaurants from Cajun to Mexican authentic places to eat. One of my favorite places to go is Paint Nite at the Pelican House Restaurant where you can enjoy delicious drinks, dessert, paint and socialize with friends. We are known as the city of Champions, but I like to consider my city a place that is welcoming for all and has a lot to offer single individuals and families. If you love to shop for good finds, try DuncanSwitch Street Market which is in downtown Duncanville. I love that I don't have to travel far to find different crafty items! Source: The Duncanville, TX data and statistics displayed above are derived from the 2016 United States Census Bureau American Community Survey (ACS).